Sure, it’s pretty convenient that you can swipe down on your locked iPhone’s screen to check out your notifications or swipe up to toggle Bluetooth on and off, but what if a perfect stranger managed to get their hands on your precious handset? 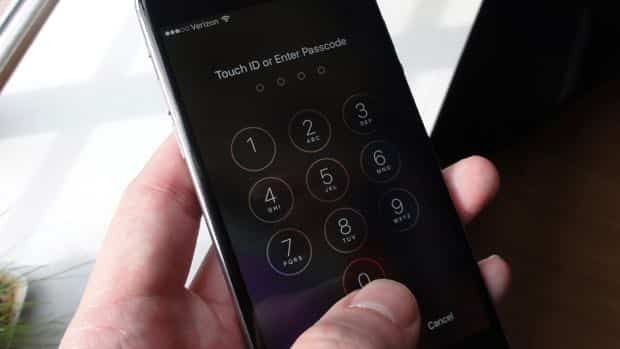 If you’re at all worried about the email, text messages, photos, and other personal data sitting on your iPhone or iPad, you should probably take a little time perusing iOS’s security features, from buttoning up the lock screen to enabling a feature that prevents thieves from reactivating—and then selling—a stolen iDevice. Even when your iPhone or iPad is locked, it’s still pretty easy—potentially, anyway—to sneak a peek at your latest messages or your calendar, or even to tinker with your device’s wireless settings. Keep iPhone thieves from messing with your wireless settings by blocking Control Center access from the lock screen. With a single down from the top of the iOS lock screen, you can open Notification Center, the slide-down panel that displays incoming messages, your agenda, the weather, and various other alerts. Also accessible from the lock screen: the Control Center, a panel of quick access controls for toggling your wireless settings, sharing files with nearby iDevices, adjusting the screen brightness, and more, all by simply swiping up from the bottom of the screen. All very nice, but consider this: if you happen to lose your iPhone or iPad, anyone who picks it up will get to rifle through your most recent messages and fiddle with your wireless settings, too. Tap Settings, Touch ID & Passcode, then scroll down and flip off the switches next to Notification View (to hide notifications of recent text messages, emails, and app alerts) and/or Today (to hide your daily agenda). 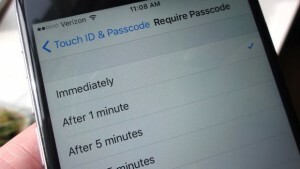 Once you unlock your iPhone or iPad with a passcode, how long of a period do you want to go by before a PIN is required to unlock the screen again? You should set your iOS device to require a passcode immediately after it’s been locked. You may be tempted to give yourself, say, 15 minutes or even an hour or two of PIN-free iPhone use, but it only takes a few moments for a pickpocket to go nuts with your unlocked handset. Note: “Immediately” is the only possible setting if you’re using Touch ID to unlock your device. 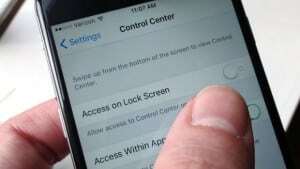 You can set your iPhone or iPad to lock itself after a period of inactivity—anywhere from one minute to never. The shorter the period of time, the more secure your device will be. Go back to the main Settings screen, tap General, Auto-Lock, then pick a setting. Even when your iPhone or iPad is locked, you can still talk to Siri by pressing and holding the Home key. 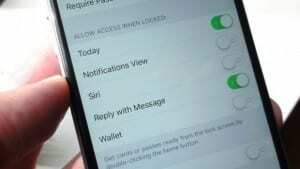 Now, Siri won’t let you (or a stranger) from accessing personal info until you unlock your handset, but you still might prefer to keep Siri silent whenever your iOS device is asleep. “Better safe than sorry” is a smart attitude when it comes to blocking Siri and Wallet access from the lock screen. Then there’s the Wallet app, which you can access from a locked iPhone or iPad by double-clicking the Home key. As with Siri, Wallet won’t let strangers make Apple Pay purchases without a PIN or a Touch ID tap first, but a better-safe-than-sorry approach might be more prudent. Tap Settings, Touch ID & Passcode, scroll down to the “Allow Access when Locked” heading, then turn off the switches for Siri and Wallet. Got a great memory? If so, consider setting a passcode that’s longer than four digits. Tap Settings, General, Passcode Lock, then flick the switch next to Simple Passcode to create a lengthy, ultra-secure passcode. Don’t want friends, loved ones or perfect strangers flicking through the recent texts and email messages you’ve received? Well, that’s what could happen If your notifications settings for Messages and Mail allow for lock-screen alerts. If you don’t want strangers browsing your incoming text messages, just tweak this Notification setting. Scroll down and tap Mail, tap the name of a mail account, then switch off the “Show on Lock Screen” setting. Rinse and repeat for your other mail accounts. 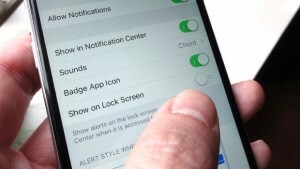 Go back to the Notifications screen, find Messages and—once again—switch off the “Show on Lock Screen” setting. Bonus tip: To split the difference between convenience and privacy, you can set your Mail and Message lock-screen alerts to only display the name of the person tried to message you. In the Notifications settings for Messages and your Mail accounts, leave the “Show on Lock Screen” setting on, but turn off the “Show Previews” setting (it’s at the very bottom of the screen). If your stolen iPhone or iPad is never found, you can still take solace in the fact that the thieves won’t be able to sell it on eBay. Nobody wants to purchase a locked iPhone or iPad. 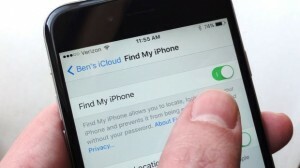 As long as “Find My iPhone” is on, iOS’s Activation Lock feature is enabled. “Activation Lock” is an iOS feature that demands the correct iCloud password before reactivating a lost iPhone or iPad. No passcode, and your iDevice will essentially turn into a beautifully designed paperweight. To turn on Activation Lock, you’ll just need to enable Find my iPhone, the essential iOS feature that can trace, lock, and even wipe a missing iPhone or iPad. Just tap Settings, iCloud, then flick the switch next to Find my iPhone. Rest assured, the data on your locked iPhone or iPad is so well encrypted, even the NSA would have a tough time cracking it. Still, if you really paranoid about keeping your personal data safe, you might want to try a setting that will make your iOS device wipe itself after 10 failed PIN attempts. Tap Settings, Touch ID & Passcode, scroll all the way down, then flick on the “Erase Data” switch. Note: If you have a little one who delights in trying to crack your iPhone or iPad passcode, you might want to think twice about turning on the Erase Data feature.